When you have a passion for something, you are always striving to improve how you do it or how you support the organization that helps you do it. That’s how I feel about the Canadian Ski Patrol. I’ve loved skiing since I was a child and for more than 65 years, I’ve had a chance to make the sport safer through this wonderful organization. Maybe you’ve seen a few of my fellow ski patrol volunteers at your local ski hill? Each year, hundreds of us are out there making the ski season safer at approximately 230 ski areas across Canada. Some patrollers volunteer every weekend at their local ski hill! These dedicated patrollers are trained in areas like accident prevention, chair lift evacuation, avalanche search and rescue,and of course advanced first aid and CPR. It takes a lot of time and effort to become a ski patrol volunteer! And that’s why people look to us in their time of need. Can you join me in recognizing the importance of the work of Canadian Ski Patrol volunteers and make a donation today to this important organization? Your gift will go towards ensuring all volunteers with the CSP receive the latest first aid training and have the right equipment should an accident happen on the snow. The volunteers do it because they love helping people—but there is a significant cant cost every year to the organization to provide the extensive training and the right rescue equipment. What’s more, over the past two decades, CSP services have also extended beyond the ski hill to o er first aid and medical support for many sporting and cultural events in communities across the country. Can you support the life-saving work of the Canadian Ski Patrol? 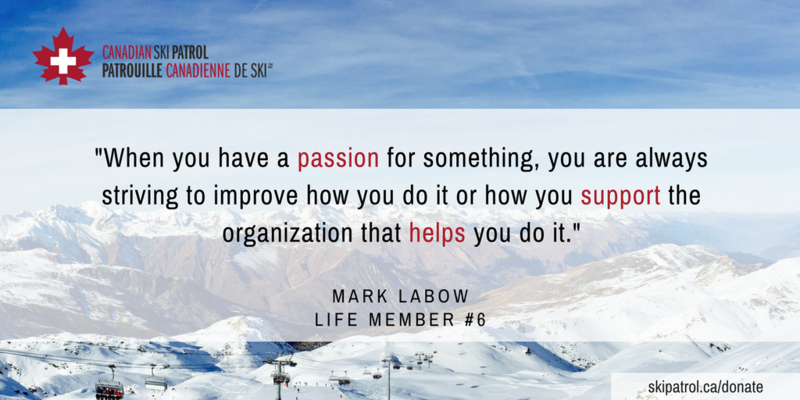 You are an important part of the work we do on the ski slopes and in your community. The Canadian Ski Patrol brings together people of all ages, from all walks of life. This winter, we are more than 4,500 volunteers strong from coast to coast to coast. Many of the people I’ve patrolled with over the years are good friends to this day. I’ve played many roles in ski patrolling—from patrolling the ski hills near my home, to being the national president of the Canada Ski Patrol from 1969 to 1975. I am also the founder and honorary chair of the Fédération internationale des patrouilles de ski (FIPS). One of my proudest moments was being inducted into the Canadian Ski Hall of Fame in 2010! I’m glad I did it and wouldn’t have missed it for the world. In October 2017, a number of my fellow members of the Canadian Ski Patrol met for lunch to talk about the good old days and learn about some new initiatives. Much to my surprise, I was presented with the new Canadian Ski Patrol Diamond Award (for more than 60 years of active service) as I am entering my 70th year of involvement with the patrol. Furthermore, I learned the award was to be renamed after me. What an incredible honour! Your donation today will have a direct impact on the safety of our friends and family who like to ski and ensure people like you and me—passionate people who want to make a difference—are there for them. PS—Your support will help ensure Canadian Ski Patrol first aid and rescue services continue at many of Canada’s ski areas as well as at special events in your community year-round. Please consider making a donation today! This entry was posted in 2018, February 2018, Member News, Public. Bookmark the permalink. ← Introducing The Furriest Member of the Canadian Ski Patrol!